Welcome to the Black River Lodge! We are a family owned and operated destination hotel located in Ironwood, MI. Black River Lodge is a small, country lodge with a resort feel. ​We offer a “different” kind of lodging experience to traveler’s in the area. Technically a hotel, the lodge is essentially a big mansion that we share season after season with all of our guests. Past guests have actually described their stay as similar to a relative’s house… but on a bigger, more comfortable scale. Many do not realize the lodge is our homestead. We work here. We play here. Most importantly, we live here. We do it all! We promote a social atmosphere and invite guests to settle in, get cozy, grab a cold one and ENJOY all the Western Upper Peninsula of Michigan has to offer! Settle In. Get Cozy. Grab a Drink & Stay Awhile! 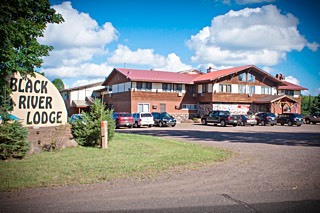 The lodge is a great option in the Ironwood area for traveler’s looking for clean, comfortable accommodations with simple amenities. The lodge has 22 unique units plus 4 townhouses to suit any traveler’s taste. We make a great “base camp” option to explore the entire Western UP over a longer stay, and are especially great for groups! Enjoy our 54’ x 22’ swimming pool & hot tub! * 3′ shallow end and 9′ deep end. * Children under 16 must be supervised by an adult at all times and swimming is at your own risk. * Bring your own life jackets if needed. No lifeguard. * No glass or food is allowed in the pool facility at any time. * Lodge guests only, no general public swimming. Below are the latest postings from the Black River Lodge Page On Facebook. What this means for us.... the waterfalls will be running strong this week!! Looks to warm back up by mid week so if your looking for an excuse to get up here and see the waterfalls in all their glory... this week will be EXCELLENT. Take advantage of our low off-season rates! IRONWOOD- Moderate to possibly heavy rainfall tonight into Monday night combined with continued snowmelt runoff could cause flooding of area streams and rivers tonight into Tuesday across the U.P. You should monitor later forecasts and be alert for possible Flood Warnings. Those living in areas prone to flooding should be prepared to take action should flooding develop. Black River Lodge shared a post. Just 5 rooms left at the lodge for the #RedBull400 #CopperPeak! Two of them have 4-5 beds and offer great value for groups. Closest lodging to the event. Bookable using our website or feel free to call! Red Bull 400Need a room for the night during your visit to COPPER PEAK for the Red Bull 400 Copper Peak?! So, looks like the weather is finally starting to cooperate a little for us! The snow is *almost* gone. The rivers are raging. The waterfalls are running. Come spend a night or two and check out #Spring in #Ironwood! Looks like there might still be enough in the woods to take a rip! Its project season for us!! I always get excited when I *actually* finish projects. Anybody else feel this way? With that... I present our updated self-serve station in the main lounge! That turns out soooo good! Looks awesome!! Love it. You did a fantastic job on it. Black River Lodge I love it❣ Talented you are! Here are the latest photos of Black River Lodge via instagram. If you have an instagram photo to share of your visit to Black River Lodge, choose “Black River Lodge” in Ironwood as your location and your photos will appear in the photo stream below.